Specifications: SEI32 32 mm 26:01:00 10 2" to 12" - 15 18 SEI45 45 mm 26:01:00 15 8" to 24" - 36 60 SEI52 52 mm 26:01:00 20 8" to 32" - 60 80 SEI65 65 mm 26:01:00 30 16"to 36" 80 70 100 70 SEI75 75 mm 26:01:00 40 16"
Bhogal Machine Impes heavy duty paper bag making machine with online 4 color flexo printing attachment. Production Capacity: 30 to 60 pcs per min. 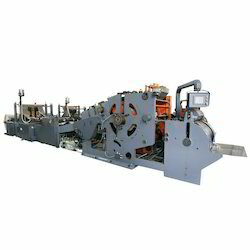 Banking on the skills of our qualified team of professionals, we are involved in providing Food Paper Bag Making Machine.